Found one file extension association related to Google Chrome Backup and 1 file format developed specifically for use with Google Chrome Backup. Google Chrome has just hit the world. 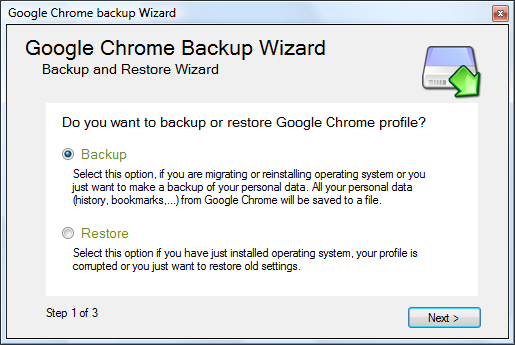 Google Chrome backup is a small tool to create, backup, restore and manage Google Chrome profiles. The profile holds personal data like history, bookmarks, etc. Everything is done with one click. Latest version also supports Chromium, which modified version of Google Chrome, for portable use. If you need more information please contact the developers of Google Chrome Backup (Parhelia Tools), or check out their product website.